Featured: Welcome Note & Links to my websites. 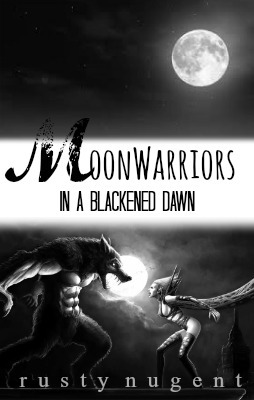 In the fifth chapter of my third novel, Moonwarriors: In A Blackened Dawn Series. I thought I would keep my readers interested in my paranormal dark fantasy stories. It starts off at Thanksgiving time. After that police officer Wilcox’s family was kidnapped. Wilcox begs the werewolf couple to track them. So can the werewolf team hunt down the serial killer. Will Wilcox’s family still be alive? via The Dogman Article – Fantasy Article – Dogman, Dogmen, Supernatural – Werewolves – Booksie. MOONWARRIORS, by Rusty Nugent – Read loglines. Screenplays, Novels, Plays, Stories. Source: MOONWARRIORS, by Rusty Nugent – Read loglines. Screenplays, Novels, Plays, Stories. I am on wattpad and posted five chapters of my third book. Please let me know what you think after you read it. via Author Rusty Nugent (RustyNugent) – Wattpad. I finally received my new iMac and I am writing/working hard on my third book in the Moonwarriors series. I am on chapter six typed up and now I am handwriting chapter seven. I always handwrite my books then I type them up on the iMac. I am excited about how it is turning out. I hope my readers reactions to it is great. Thanks for reading. I am working hard on the third book in the Moonwarriors Series. My Imac has been broken for almost a year now, and next month I am getting it in the shop. So, soon I’ll be back online on my own pc. Then, I can start to type up the third book from my hand written book. Keep an eye out for more information. Blessed Be. Until Next Time . . . Hanging out in front of his mom’s apt. Check out Angie’s Diary. It’s a online book place to read review, interviews, and short stories. Look for Moonwarriors there, coming soon.